Morning Motivation — What’s between you and your dreams? 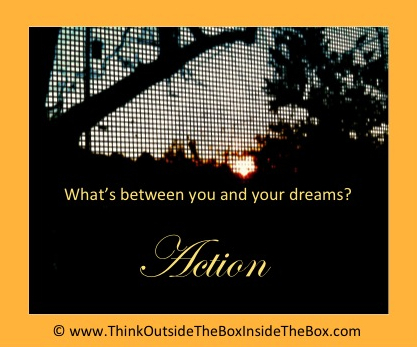 What’s between you and your dreams? Have you ever felt like there was a film, a screen, a barrier between your dreams and actually creating them? It’s one thing to wish for something, formulate an idea of something, or talk about something. It’s another thing to take that wish, that idea and take those words and combine them with the necessary action to actually create something! It isn’t magic. It’s acting. Act on that wish. Act on that idea. Act on all of that talk. Action takes down the walls. Action removes the chains. Action releases the ties. Action clears the view. Free yourself to create by taking action! Whatever you want to create, take action to begin creating it right now from wherever you are with whatever you have. Take action to create your dreams. Great post. Sometimes the action we need is to NOT do something. In my case, DON’T answer emails, DON’T answer the phone, DON’T say yes to someone just because last time I said No. I learned all this today. My goal was to begin acting like a committed writer on October 1, today. I did not succeed very well but tomorrow is another day, and now I know what I will NOT do.